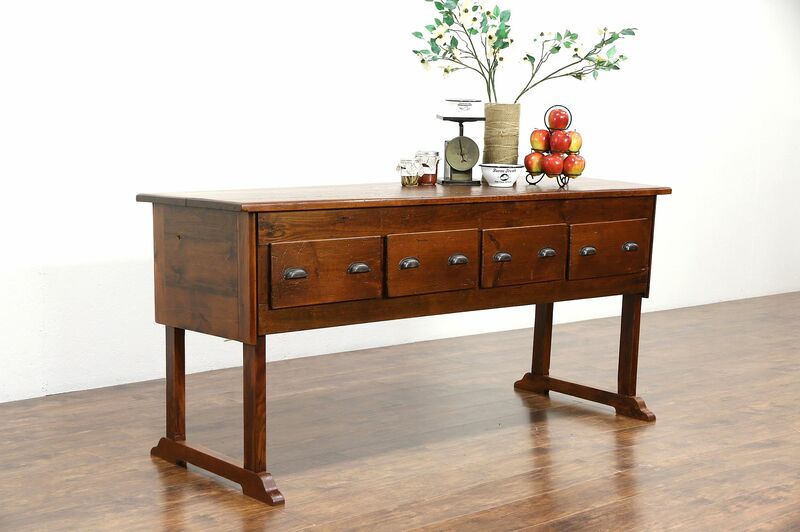 A picturesque country pine counter could function as a kitchen island or wine and cheese tasting table. Hand made about 1900 for the Shawano Lumber Co. in Wisconsin, there are four large drawers with original tin bin pulls. The restored finish is in excellent condition, preserving loads of stains and mars for antique character on this rustic and primitive counter. There is a warp from age that shows on the top, see photos. Size is 78 1/2" long, 24 1/2" deep and 36" tall.